BSBG has teamed up with Design Confidence to provide a series of fire safety master classes aimed at deconstructing certain aspects of fire safety design. The series has a focus on the UAE, however the principles apply internationally. This technical study, written by Aaron Mc Daid, is related to smoke control for buildings in the Middle East, and the application of Fire Engineering Principles which can be used for design. BSBG and Design Confidence have collaborated on countless innovative and holistic design solutions on a wide range of developments throughout the UAE and internationally. 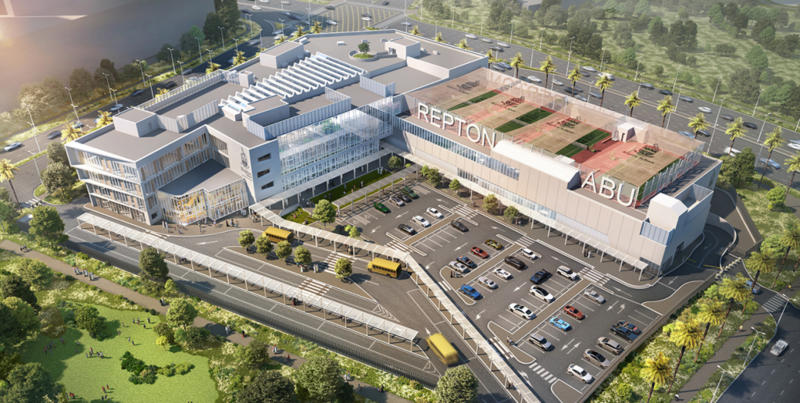 Some honourable mentions for projects where an advanced dynamic computer modelling approach has been undertaken, are Repton School in Abu Dhabi and the Dubai Festival City development. The advanced performance-based approaches outlined below have been adopted with multidisciplinary inputs in order to maximise efficiency and optimise the architectural aesthetic, while still meeting the prescriptive requirements of the Fire Code and fire safety objectives for the design. Both projects are currently in full operation and are approved by the relevant fire safety authorities. Smoke control can be accomplished by using either an active or passive system. Typically, when we refer to smoke control we think of active systems, but control can be achieved with something as simple as the provision of physical separation, such as a fire barrier wall between two spaces to prevent the spread of smoke. Another example of a passive system is a natural ventilation opening which can be used to ventilate hot smoke. A natural ventilation system requires a buoyancy-driven flow (the difference between smoke temperatures and outside air temperatures), but these are generally ineffective within a humid desert environment, such as that of the UAE. More commonly in the region, active smoke control will be used. Examples of these are mechanical extractors that remove smoke, or the pressurisation of a space to prevent smoke ingress. In the Middle East, building codes are largely influenced by American codes and standards, such as the International Building Code (IBC) and the National Fire Protection Association. Put simply, a ‘code’ specifies where a type system is required, whereas a ‘standard’ sets out how to design that system. For example, the NFPA 5000 building code specifies that sprinklers must be present in a high-rise building. The sprinkler system must be designed to the NFPA 13 standard for sprinkler design. In Dubai the primary building code is the UAE Fire Code. This building code is the primary basis for the design of all buildings, and provides detailed design guidelines for where a given system is required and what standard it needs to be designed to. For smoke control systems, the UAE Fire Code requires systems to be designed to NFPA 92 standards. 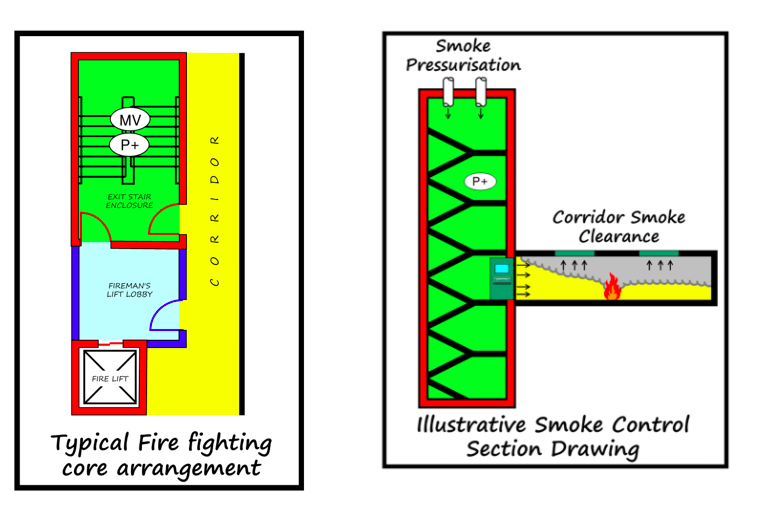 Pressurisation and Corridor Smoke Control are examples of prescriptive design criteria. Pressurisation positively pressurises a space by filling it with fresh air, so that in the event a door is openened smoke or heat is prevented from entering the space. A great example of a space where pressurisation is provided is in stairways in highrise buildings (UAE Fire Code Chapter 10), where a 12.5 or 25pa pressure differential is required based on NFPA 92. In the Middle East, buildings tend to be large, complex high rise structures. Buildings with high occupancies such as these require special fire safety management. To find out more about Design Confidence you can visit their website: www.designconfidence.com or follow them on LinkedIn. You can follow Aaron on LinkedIn here.